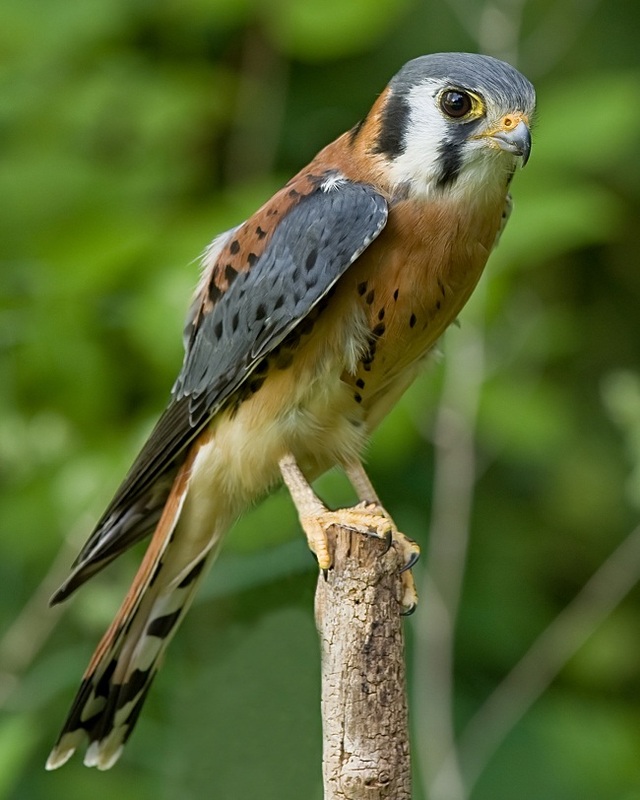 The American Kestrel (pronunciation: Kess-Trell) is the smallest of the North American falcons. Widely distributed over varied habitats, it is also the commonest of all the falcons found in the country. Frequently seen perching on wires and poles, these elegant raptors would often flap their long tails to adjust their body balance to stay in place. These dappled creatures, soaring high above in the air, gliding against the direction of the wind, flapping their wings rapidly, is a common scene in almost all the cities and the country sides in the USA. 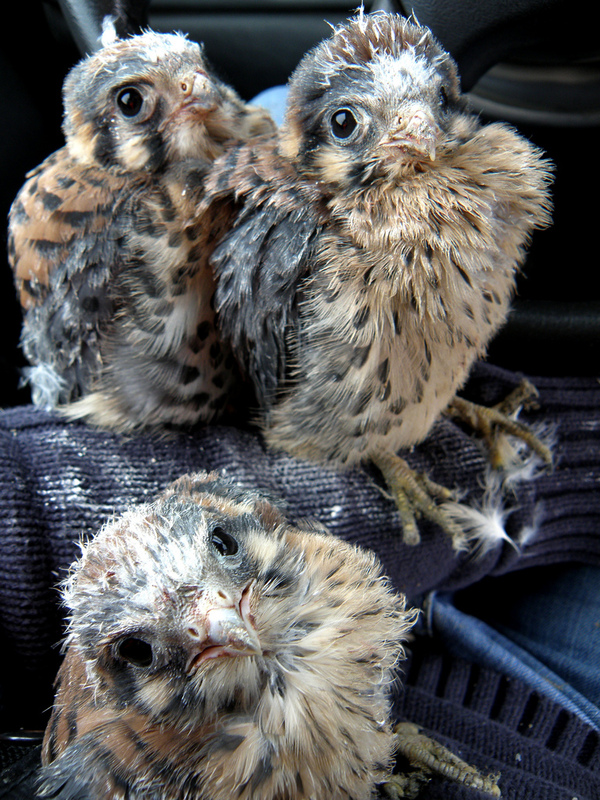 American Kestrels are also widely regarded as pets for training purposes. Sexual Dimorphism: These birds are sexually dimorphic, with the female being larger than the male. However, the coloration and plumage are almost the same. Size: The length of these birds is 12 to 27 cm (4.7 to 10.6 inches), while with wingspan, they are 50–61 cm (20–24 inches). Weight: The males weigh between 80 and 105 g (2.8–3.7 oz), while their female counterparts are between 100 and 120 (3.5–4.2 oz). 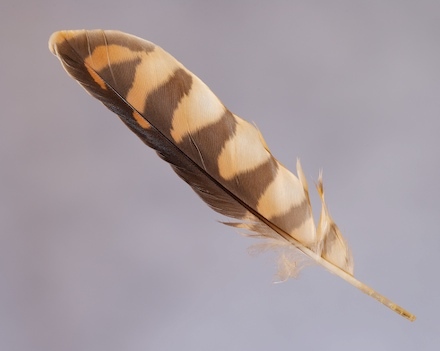 Plumage/Feather: The feathers below (around the chest and the stomach) are pale, but with a warm copper brown on the back and tail feathers, with black spots all over the body. Wings: Their wings are long and narrow. Males have wings that are gray to slate blue on both sides, while the females have copper color wings. Head: They have a large head with black vertical slashes on both sides of the face in both the sexes. Feet: They have a pair of strong feet with claws (talons) that are sharp enough to grab hold of their prey easily. Eyes: Their eyes are round and bead-like. Tail: Their tails are long and square-tipped that measure between 11 and 15 cm (4.3–5.9 inches). The average longevity status in the wild is about 11 years, while in captivity, they can live for up to 17 years on an average. 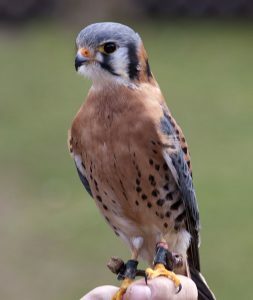 With its wide range of distribution, the American Kestrel live as far north as the region of the Arctic Circle of Alaska and Northern Canada, and down south till Tierra del Fuego in South America, spread widely everywhere in between. Other than their main distribution regions, they are also spread in parts of the West Indies, on the Mexican island of Guadeloupe, and off the coast of the Chilean Juan Fernandez Islands. The AK needs open grounds for hunting for which reason prefers mountain meadows, savannas, deserts, open pine forests, marshlands, grasslands, and mixed woods or grasslands. They are also seen in agricultural lands, airfields, athletic fields, cemeteries, vacant building sites in cities, power line corridors, lake shores, and even along the sea-coasts. 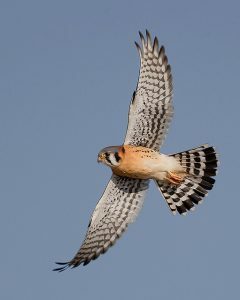 The American Kestrel hunts primarily from a high perch and then suddenly swoops down to capture its prey. Alternately, if there are no good perches around, they would hover high above in the sky looking down searching for food using its acute eyesight. 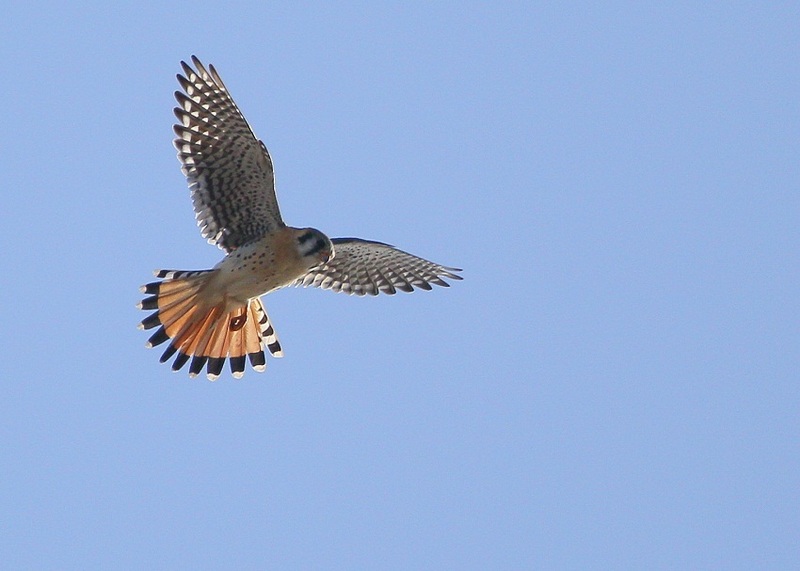 These kestrels are skilled fliers. As it catches its prey, it would kill it by biting the prey on its head or neck. They would either feast upon their prey instantly, or else, would store them as future reserve when there is a scarcity of food because of unfavorable climatic conditions. 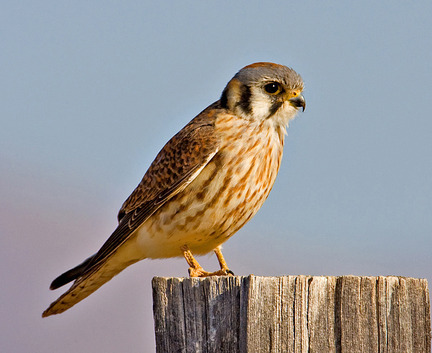 American Kestrels are not by nature social birds and are known to even harass larger raptors. 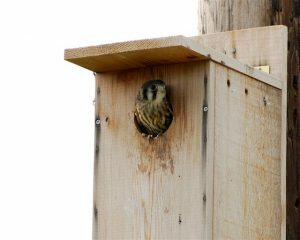 Although, these birds have often been seen living in manmade nest boxes, they do not make good pets, nor are easy to be tamed or are friendly to humans. 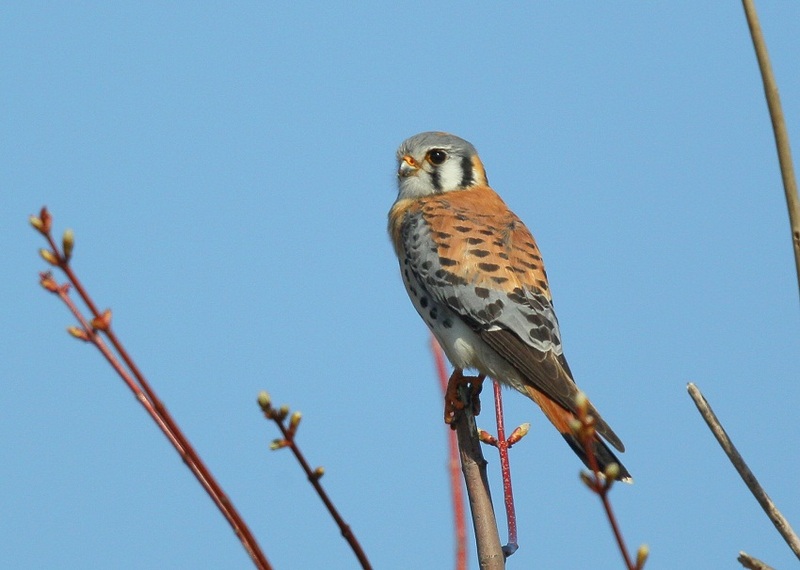 American Kestrels have a very limited set of vocalization. The primary call is a ‘klee’ or ‘killy’, emitted especially in a series of 3-6, especially when excited. These voice-notes do not last for long. They also give out long whines lasting for about 2 minutes, which is mostly noted in courting birds, or those that are feeding the juveniles. Also, during friendly interactions, both the male and the female emit fast chitters. Not all kestrels migrate. 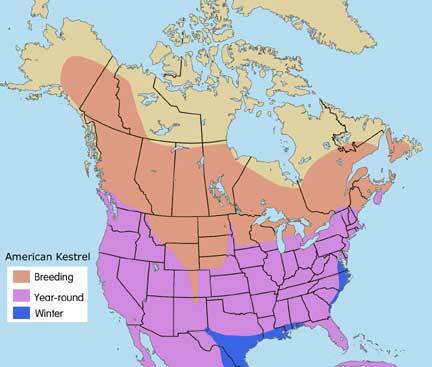 Typically, kestrels that live closer to the equator in the tropical latitudes stay there year round. However, those that live in the northern and southern-most parts tend to migrate in search of food, while others will not migrate for the winter. Their migration patterns depend on the strength and hunting skills of the individual birds, as also on the intensity of weather changes. American kestrels are monogamous. They would bond with one during partnership, although that’s after building their nests. Courtship behaviors include courtship feeding, flight displays, etc. The territorial males perform elaborate dive displays for advertising their territory to attract a female. Soon after, their relationship begins to develop, and once developed, it becomes strong with the passage of time. Mostly, their relationships are permanent. Each year, during mating season, the pair returns to the same place for nesting. Most pairs breed between early spring and late summer, although, many of these pairs might as well breed during different times, which varies on their range and habitat. 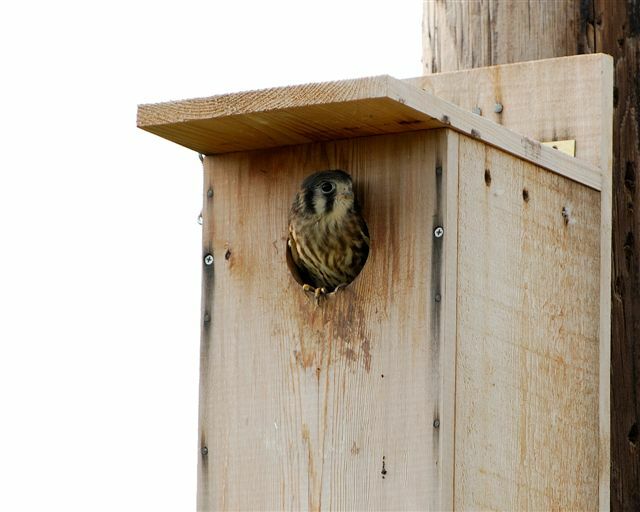 After their brood is born, these birds would often house in the hollows of trees or rock crevices, or even inside buildings, telephone poles, fence posts and other man-made structures. Their typical clutch size is 3-7 that hatch in around a month’s time. Both the sexes incubate the eggs, although the male would do so only in the absence of the female. The father falcon usually brings food for both the mother and the babies at least for the first 10 days. The females would protect the hatchlings after birth, while the male would begin leaving their nest more often, soon after. 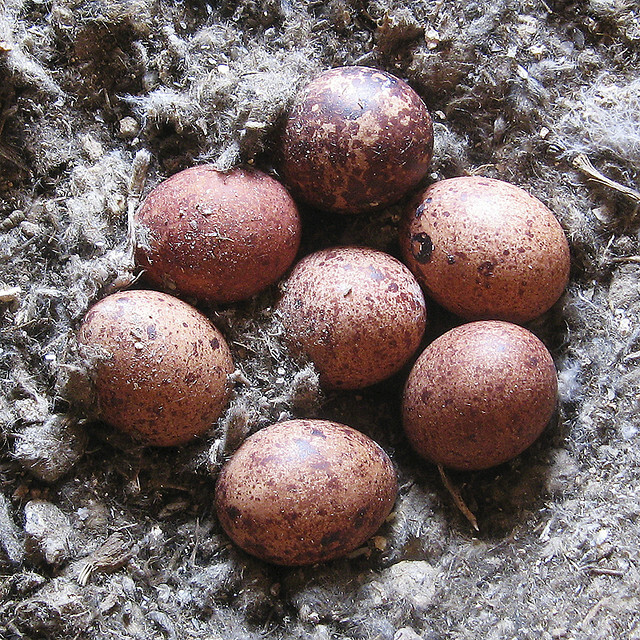 The incubation period lasts for 26–32 days. 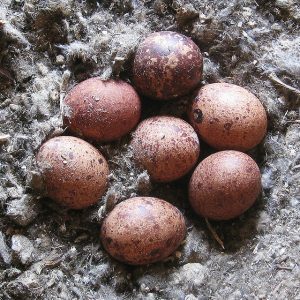 The hatchlings are born altricial, usually living helpless, depending on parental care and protection. They are born with pink skin, covered with soft, white down feathers. This stage lasts for almost 3 weeks. The young ones, both the males and the females, reach their sexual maturity when they are around one year old. These falcons usually hunt in groups, along with the youngsters. Thus, the adolescents get an opportunity to build up their hunting skills. They commonly survive upon insects and invertebrates like dragonflies, cicadas, beetles, grasshoppers, butterflies and moths, scorpions, spiders, etc. These raptors are used to diverse feeding habits. They also feast upon small mammals like bats, mice, voles, and shrews. They also prey upon small birds like the American goldfinch, though it does not constitute a large part of their diet. The American Kestrels have the expertise catching insects right out of the air, or else, they would forage from the ground. Unlike other raptors that use their claws to kill the prey, these birds have teeth-like structures on either sides of their bill that are enough to snap the spinal cords of reptiles, rodents and birds, rodents. 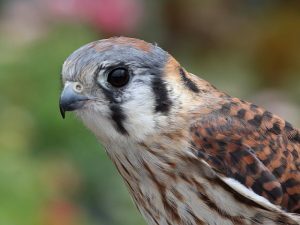 The American Kestrels are adapted to survive anywhere between 12,000 feet (below sea level) in the Rockies and 14,000 feet in the Andes. 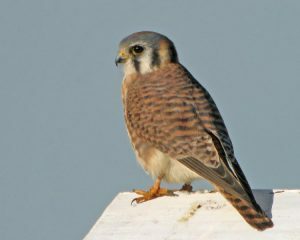 Scientists inferred, the black patches under the eyes of the kestrel serve the same purpose as the facial black-smudges used by the athletes to beat sunlight. These marks prevent the sunlight from reflecting back in the bird’s eyes. Like the Eastern Screech-Owls, their digestive systems are adapted to digesting almost all insects. The dark spot atop the kestrel’s head serves a completely different purpose. While a predator oversees a kestrel, trying to attack it from behind, the spot on its hood resembles false eyes, thus fooling the predator, confusing its head as its face. Unlike most other falcons, these falcons have a small body, which helps them toss around easily in the wind. This bird has a very keen vision, which again helps them avoid predators. The known predatory enemies of the American Kestrel are the larger raptors like great-horned owls, red-tailed hawks, prairie falcons, etc., and mammals like bobcats, skunks, coyotes, and raccoons. 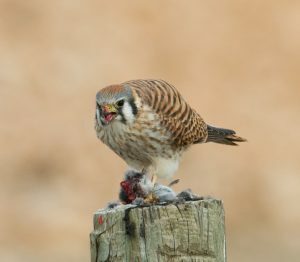 Though, the kestrel chicks, the young birds and the eggs are mostly targeted by the predators. The American Kestrel is not a threatened species. The IUCN 3.1 has categorized this bird under the ‘LC’ (Least Concern) species list. 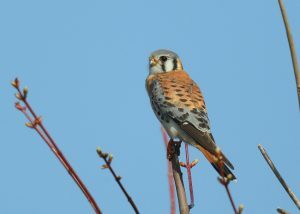 The American Kestrel is one of the most colorful of all raptors. Among the kestrels, they are the second smallest in the world, with the Seychelles kestrel being the smallest of them all. The term ‘hawk’ is frequently used as a generic term for a bird of prey. Despite being formerly called the ‘sparrow hawk’, the American kestrel has been technically categorized as a ‘falcon’. Raptor Population Index (RPI for migration counts), has collectively indicated a long-term decline of American Kestrel populations in different regions of USA. ‘Falco sparverius’ is the nominate subspecies among all the seventeen other subspecies. When they sit, these falcons bob their heads and pump their tails. This behavior, however, has not been fully understood. But evidences suggest that, these are pre-flight or pre-attack motions. Deadly adenovirus diseases have been described in these birds that was first noticed in a wild-caught American kestrel. 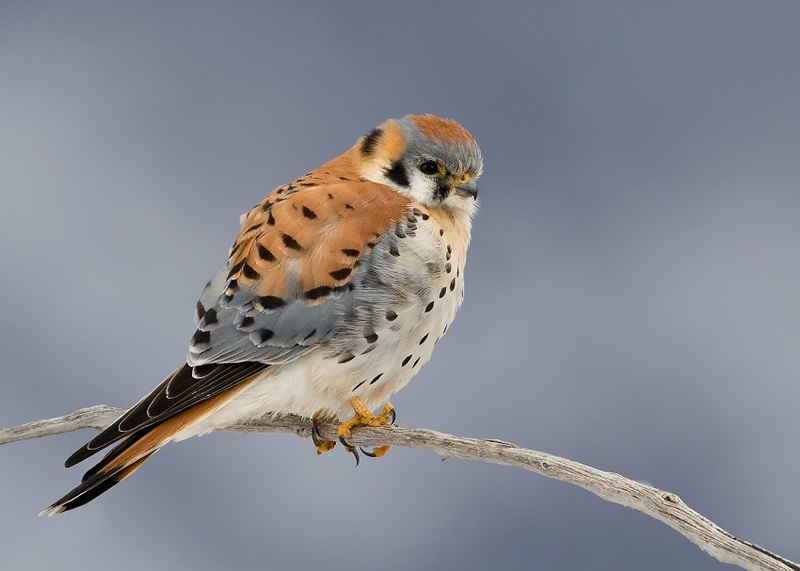 American Kestrels are known in different names like ‘Sparrow hawk’, ‘killy hawk’, and ‘mouser’. American Kestrels have a wonderful dive speed that can reach up to 39 mph. The dark slashes on the sides of their faces are sometimes called “mustaches” or “sideburns”. 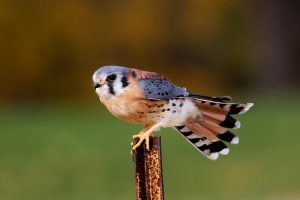 The American Kestrels can see ultraviolet light, which means, they can see the colors that are not visible to the human eyes.